These 3-element Kellners offer amateurs an excellent alternative to expensive oculars. 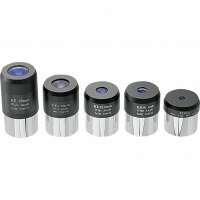 The lenses are carefully polished from quality optical glass to ensure sharpness. All five kellners are fully coated with anti-reflection material to maximize light transmission and improve image contrast.